Mayes Taxidermy Studio » Blog Archive Is my trophy big enough to have mounted? Is my trophy big enough to have mounted? You worked very hard for it. You had a memorable hunt to get it. You made a great shot. It was someone’s first deer, fish, etc. 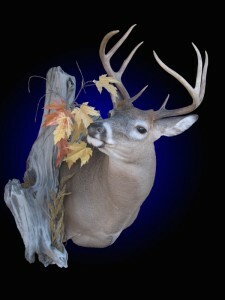 You appreciate the “art” of taxidermy and like to accent your home décor with your mounts. I personally have hunted for nearly 40 years. I have been fortunate enough to hunt around the world for some very unique trophies. I hunt deer every year, both with gun and bow, but certainly don’t have a pile of “booners” (actually none) or P&Y’s to my name. If I shoot a buck, it means a lot to me and I normally mount it. I don’t care if someone else would normally “pass” on that buck. It is almost always an exciting experience to me and having the mount helps me to relive the experience. I also feel that GOOD QUALITY TAXIDERMY is pleasing to look at and can enhance the look of any home, regardless of the décor. POOR QUALITY TAXIDERMY on the other hand is what turns some people off to having mounts in their home. The REALLY big ones make up a very small portion of the game and fish that we mount. Most of what we mount is done for the reasons shown above. Don’t make the mistake of trying to save money and get a sub-standard job done on your “trophy” just because it is not “big enough”. If it means enough to you to have it mounted, it should be done properly. You are going to display it in your home and if it looks bad when it’s done, it’s not such a “good deal” any more.